Our garage was a mess. In fact it was overflowing into our home. Now, with the creativity of Nuvo Garage to fully utilize all of the space in our garage, everything has a place and we can fit our car in. They built solid overhead shelving and customized it to fit precisely into our space, They also applied the slatwall on our curved side wall which not only looks great but gives us another space to store our things. They organized our stuff into logical sections so now everything has a place. And, to top it off, they included a silver speckle in the floor that compliments the stainless steel cabinets! This busy professional couple with two young children were feeling overwhelmed by the amount of stuff they had accumulated in their house. 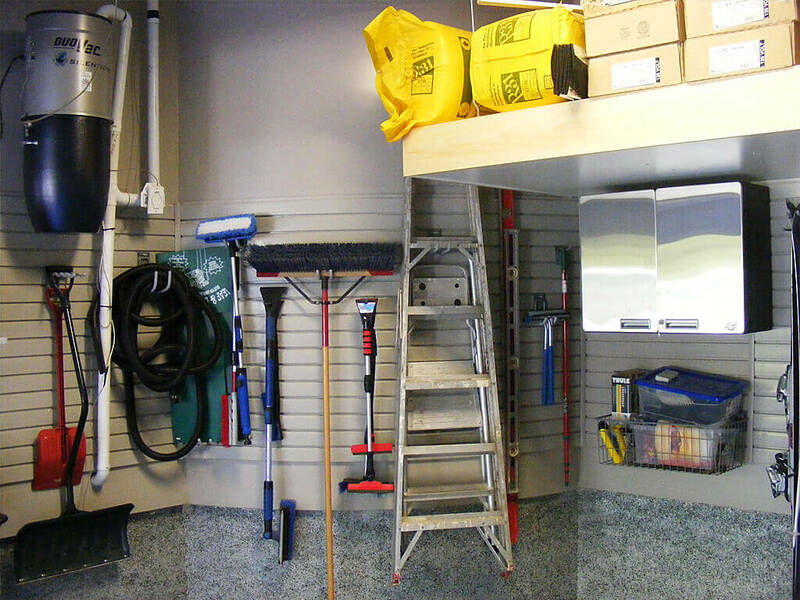 When the garage became a dumping ground for things they no longer had room for inside, they decided it was time to get organized. They are avid cyclists and skiers, so they needed a place to store their bikes and skis. But they also wanted room to park the car, as well as have storage space for tools. They knew there were a lot of things they didn’t need to keep, so I helped them arrange for the removal of unwanted items, and in the process found some wood that was perfect for building platforms for overhead storage. I used it to construct a U-shaped platform along the rear and right walls of the garage to store camping equipment and other seasonal items. I applied a pine facing and finished the underside of the platform with white laminate to give it the appearance of a floating shelf. I also installed two 4×8 foot steel racks over the garage door to maximize overhead storage space. Getting everything off the floor is key to making the best use of space. 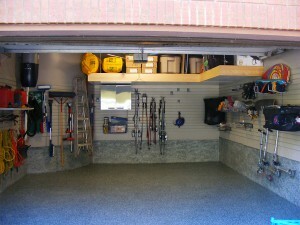 I installed slatwall around the perimeter of the garage to allow for the hanging of items such as ski poles, brooms, electrical cords and the kids’ scooters. Canadian garages are rarely a standard shape and size. 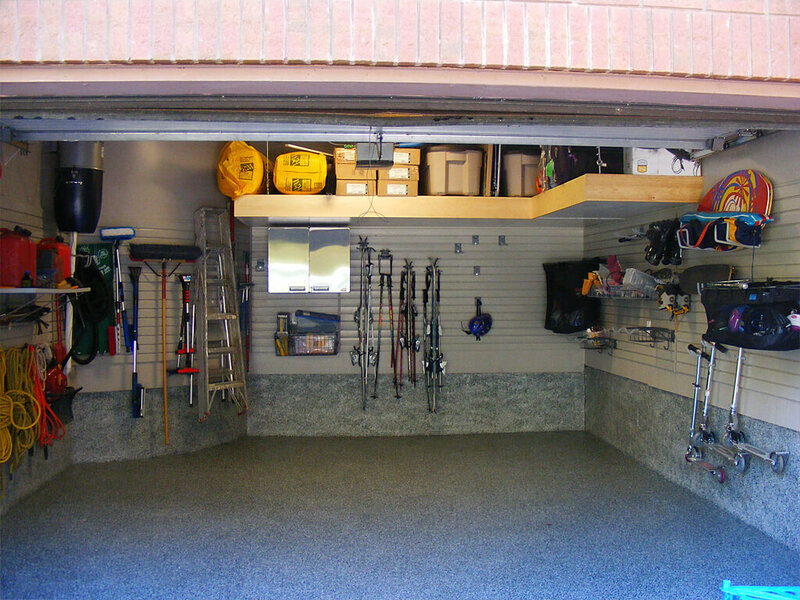 In this case, a curved wall in the rear left corner of the garage made it a problematic area for storage. I found that the slatwallwould bend to form it around the contour and it now became useable space for hanging things. I also repositioned the central vacuum to create more accessible wall space. 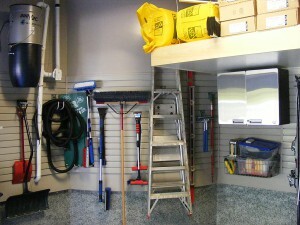 The visual appeal of the garage was also important to the client. To create a seamless look, I painted the ceiling and the areas above and below the slatwall in a matching colour. I finished the floors and the lower sidewalls with polyaspartic coating, which is attractive and provides waterproofing. A hint of sparkle in the colour mix for the polyaspartic coating further enhances the visual impact. I also installed handsome stainless-steel Hercke upper cabinets at the back of the garage to safely store chemicals and other hazardous items away from the reach of little hands. 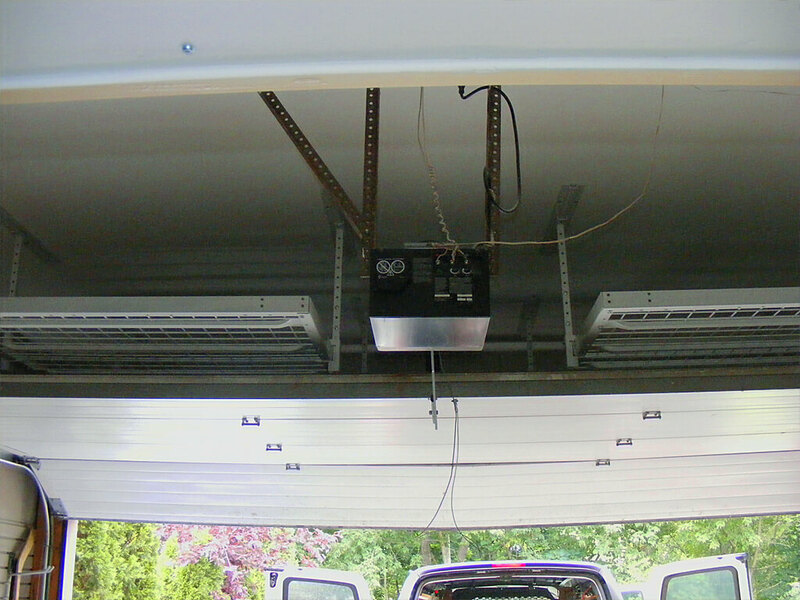 And a ceiling light fixture with T8 fluorescent bulbs allows the family to see their organized garage in a bright new light. One-size fits all is rarely the case in garages. With a few custom-built pieces, Iwas able to maximize the family’s storage space and free up more room for storage inside their home.